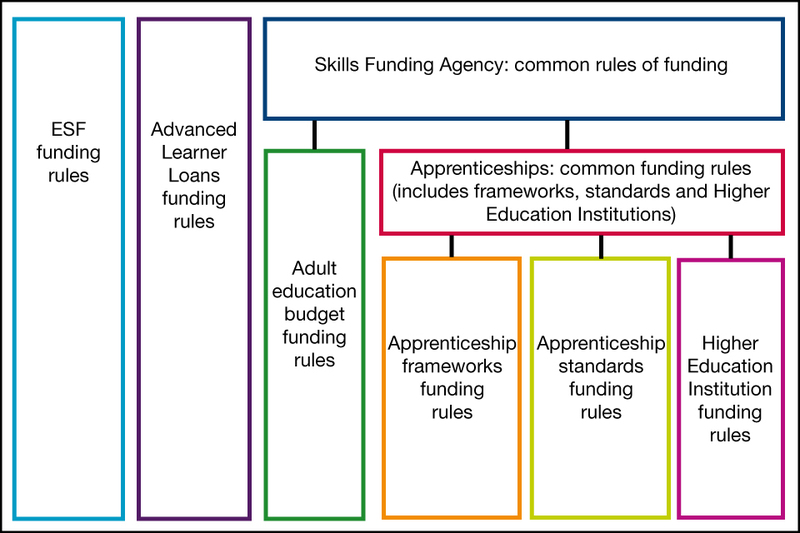 The rules that apply to all further education provision funded by the Education and Skills Funding Agency (ESFA). The web pages listed below, according to funding years, set out the rules for publicly funded colleges, training organisations, local authorities and employers (FE providers) that offer education and skills training. This document sets out the adult education budget (AEB) funding rules for the 2018 to 2019 funding year (1 August 2018 to 31 July 2019). The rules apply to all providers of education and training who receive AEB funding from the Secretary of State for Education acting through ESFA. These documents set out the funding rules for employers, employer-providers and training providers. The funding rules cover the period August 2018 to July 2019 and apply to all apprenticeship programmes starting on or after 1 August 2018. This includes both apprenticeship frameworks and standards. This document sets out the advanced learner loans funding rules for the 2018 to 2019 funding year. This document sets out the rules that will apply to all adult education budget funded provision for the 2017 to 2018 funding year. These documents set out the rules that will apply to all apprenticeship provision funded by the ESFA following the introduction of the apprenticeship levy. These documents set out the advanced learner loans funding rules for the 2017 to 2018 funding year (1 August 2017 to 31 July 2018). These documents set out the rules for funding, including the evidence required to support funding for 2016 to 2017. These rules will apply from 1 August 2016. These documents set out the advanced learner loans funding rules for the 2016 to 2017 funding year (1 August 2016 to 31 July 2017). These documents set out the rules for providers who receive funding from the ESFA to offer education and skills training for 2015 to 2016. It also includes the trailblazer apprenticeships funding rules 2015 to 2016 for all organisations in receipt of funding for the delivery of training or the end-point assessment of apprenticeship standards for the funding year 2015 to 2016. This page also contains information about the funding and performance-management rules for the European Social Fund (ESF) 2014 to 2020 Programme. The rules apply to all providers funded by the European Social Fund through the ESFA. This page also contains the funding rules which apply to the trailblazer apprenticeship standards. These rules apply from 1 September 2014 to 31 July 2015 for all organisations in receipt of funding for the delivery of training or the assessment of Trailblazer apprenticeships for the funding year 2014 to 2015. 27 January 2017 Added a link to the adult education budget funding and performance management rules 2017 to 2018. 25 October 2016 Added a link to the draft rules that will apply to all apprenticeship provision funded by the SFA following the introduction of the apprenticeship levy. 23 March 2016 Updated information for version 2 of the funding rules 2016 to 2017. 29 January 2016 Published 29 January 2016: Combined rules for Adult Education Budget.